LifeFone offers a quality product and excellent warranty benefits. However, you have to be willing to pay for extended services with LifeFone. My grandmother was always independent. No one could slow her down. She did what she wanted to do, but after the death of my grandfather, concern grew among my family about her staying alone all of the time. I started looking into options to ease everyone’s minds. That’s when I came across LifeFone, which was a way to give my grandmother her independence but keep an eye on her at the same time. 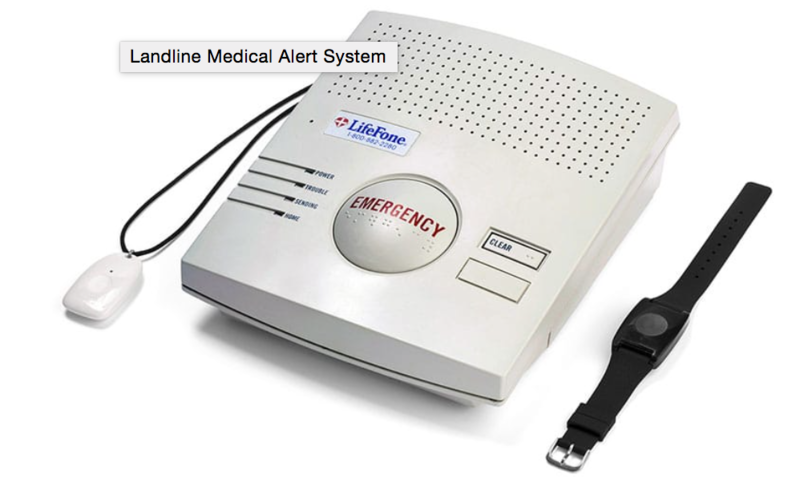 A medical alert system, such as LifeFone, provides in-home care by monitoring your well-being while you are home alone. This can provide you with the peace of mind to know you can continue to live your life as you age. That’s why you should consider LifeFone if you believe your health is not at the level that it once was and staying home alone is a bit worrisome. You might be able to regain a lot of the freedom that you thought you’d have to give up before. That’s the reason that I started looking at alert systems for my grandmother. However, her health was not so far gone that she needed more intimate medical attention. If you need specialized care, you might want to look into other options that better fit your needs. 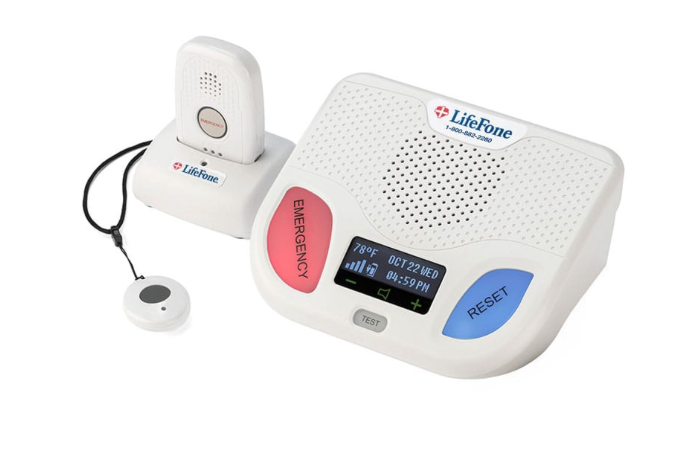 Before purchasing LifeFone or another medical alert system, here are a few questions you will want to ask yourself: do you have a landline, what cellular providers are in your area, do you have a spouse that needs monitoring, do you often leave your home alone, and what kind of medical conditions are you facing? 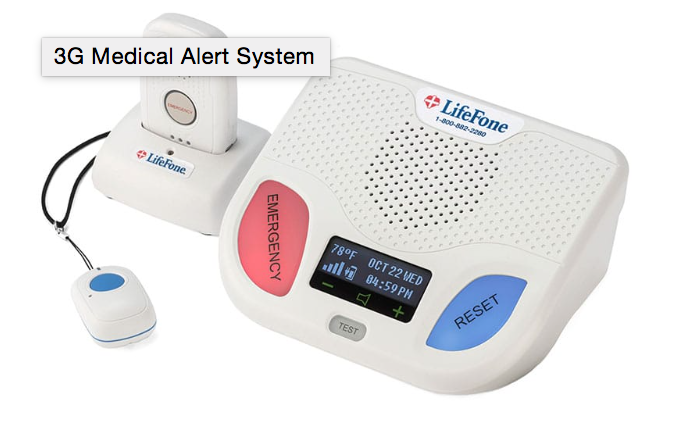 LifeFone is a top level medical monitoring company that has been around since 1976. This company is not only a provider but an innovator as well. This is a company that emphasizes its mission to provide for each individual and the needs they have. That makes them a company that is there to assist you with all of your emergency monitoring needs. You can purchase a range extension with LifeFone that will reach up to 1,500 ft. This is one of the longest ranges you will find on a medical alert system. You receive a lifetime warranty for the equipment and the price won’t change. You can get an emergency button for your spouse on the in-home landline system for free. LifeFone will make daily calls to a subscriber for an additional $19 per month, or you can check in daily with LifeFone for an additional $6 per month. This lets someone know that you are at least up and moving around each day. The device only has a 480 ft range unless you purchase an extension. This is short compared to most other medical alert systems. LifeFone does not do weekly or monthly tests on the system, so you don’t have that added security. However, you can purchase daily calls or activity assurance with your plan. The cellular system is limited to AT&T service, so you might be out of luck if you don’t have AT&T in your area. 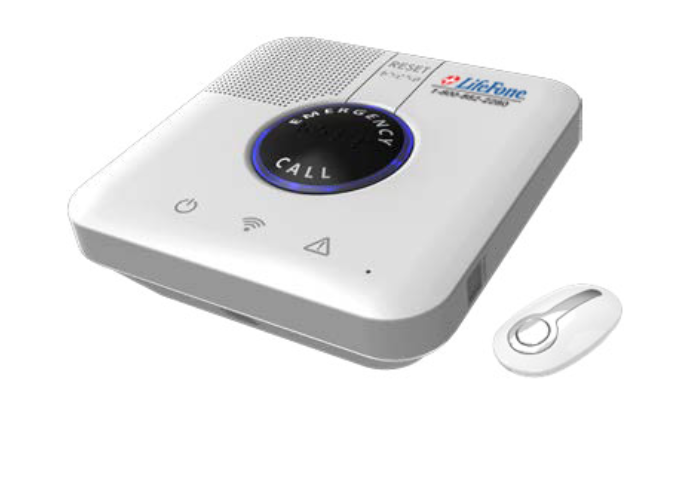 The at-home landline emergency response system from LifeFone comes with a base station and an emergency button. To work, it needs to be hooked into a landline. After that, you receive 24/7 monitoring. 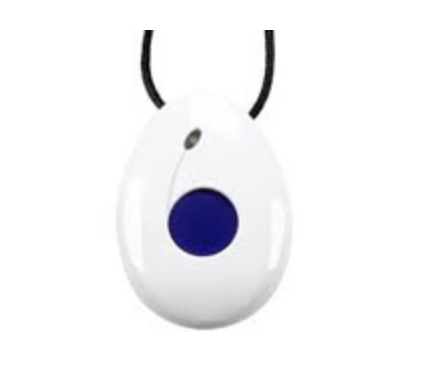 The emergency button comes as either a necklace or a bracelet, and both are waterproof. I know my grandmother would have preferred a bracelet, but I like that it has options. The emergency button is limited to a 480 ft range from the base station. However, you can purchase a range extension that can reach up to 1,500 ft. Still, 480 ft will cover the range of just about any house. It’s the yard you have to worry about. The base station comes with a 32 hr backup battery. This means you don’t need to worry if your power goes out for a while. You can take the base station with you if you travel and the location you are traveling to has a landline. All you have to do is call LifeFone and let them know. Also, with the base station, you get two-way communication with the monitoring center, and you can answer phone calls by pressing your emergency button. The price for the at-home landline emergency response system is $24.95 per month. The at-home 3G and 4G cellular emergency response systems work like the landline system in that it comes with a base station and an emergency button. However, with this cellular system, you do not need a landline hookup for it to work. Instead, it runs off of AT&T service in your area. For that reason, you will want to make sure that AT&T registers a strong signal around your home. With this system, the emergency button has a 1,300 ft range from the base station. Obviously, this is quite a bit further than the 480 ft provided with the landline system. You can also get your button as either a wristband or necklace. Similar to the landline system, the base station has a 32 hr backup battery and two-way communication. The price for the at-home 3G and 4G cellular system is $30.95 per month. The at-home landline emergency response system can be upgraded to include fall detection for an additional $5.00 per month. This means you can protect yourself or your loved one if they happen to fall and are incapable of pressing the emergency button. The fall detection button has a 600 ft range from the base station. You can get fall detection for the at-home cellular system for $38.95 per month. Note, this unit only has a 30 hour backup battery. You only lose two hours, but that might matter if you face frequent outages. You can upgrade your system to include an at-home system and an on-the-go system, so you can be protected while you are away from your house. My grandmother often walks the neighborhood, so I love this option. before it needs to be recharged. Since this last an entire day, there shouldn’t be much worry there. The mobile button is also waterproof, and it uses GPS to determine your location if an accident occurs. The base station and the mobile button run off of AT&T cellular service. The base station has a 32 hr backup battery. The price for the at-home and on-the-go package is $36.95 per month. This package gives you everything in one. You get the at-home cellular system, which again runs off of AT&T. You also get the mobile button for when you are away from your home, but now, you have the added protection of fall detection. The price for the at-home and on-the-go package with fall detection is $46.95 per month. One of the great things about LifeFone is that they offer free spouse monitoring at no additional cost. You simply set up the system and purchase an additional button. You can have LifeFone check in on you daily if that makes you feel more secure. This is a benefit the company provides for people who live alone, so they can keep living alone. To get a daily check-in call, you have to pay an additional $19.00 per month. If you want to check-in with LifeFone daily, the company provides you an option where you can do this called activity assurance. This lets someone know that you are up and moving around for the day. You have to pay an addition $6.00 per month for activity assurance. If you would like, you can purchase additional help buttons that can be attached to your wall. This way if you forget your emergency button then you will still be able to receive help by pressing the button on the wall. These help buttons cost $39.95 each. 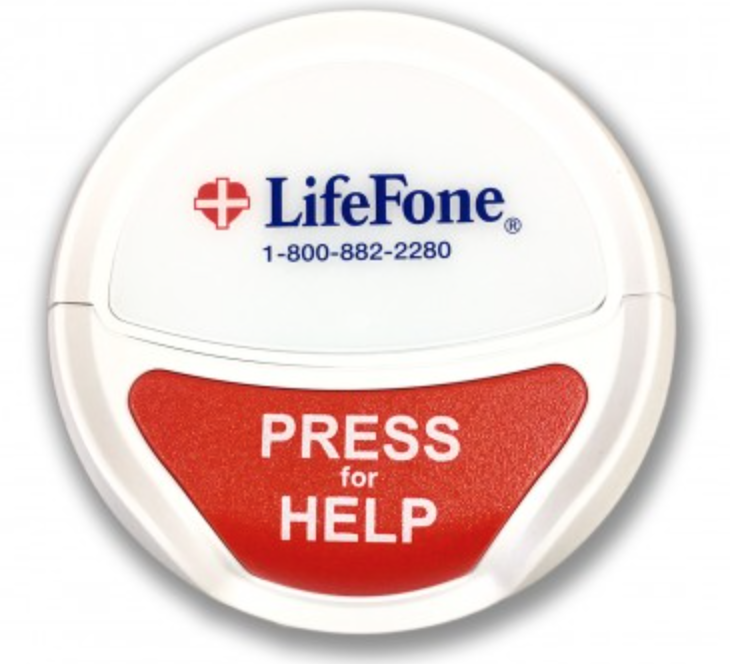 If you don’t want to carry around an emergency button, you can download the LifeFone Mobile Alert app and use your phone as an emergency button if an accident occurs. If you are a new customer, this service will cost you $7.95 per month. It runs existing customers $5.95 per month. LifeFone also offers a family guard app, which can be used to monitor your family and their whereabouts. With his app, you can monitor up to three family members. It gives you their GPS location, and it provides everyone an emergency button that can be pressed if needed. The price for this app is $9.95 per month. LifeFone provides great warranty options. To start, you get a 30 day money back guarantee, so if you are not satisfied with the product, you can return it within that time period. You also can cancel your plan at any time, so no need to worry about a long-term contract. With LifeFone, you get a lifetime price guarantee, so you are assured you won’t have to pay more after you set up your plan. The company will also replace any equipment that malfunctions while you are using it. After looking around the internet, I have found a few reviews that will give you an idea of what other people are saying about LifeFone. 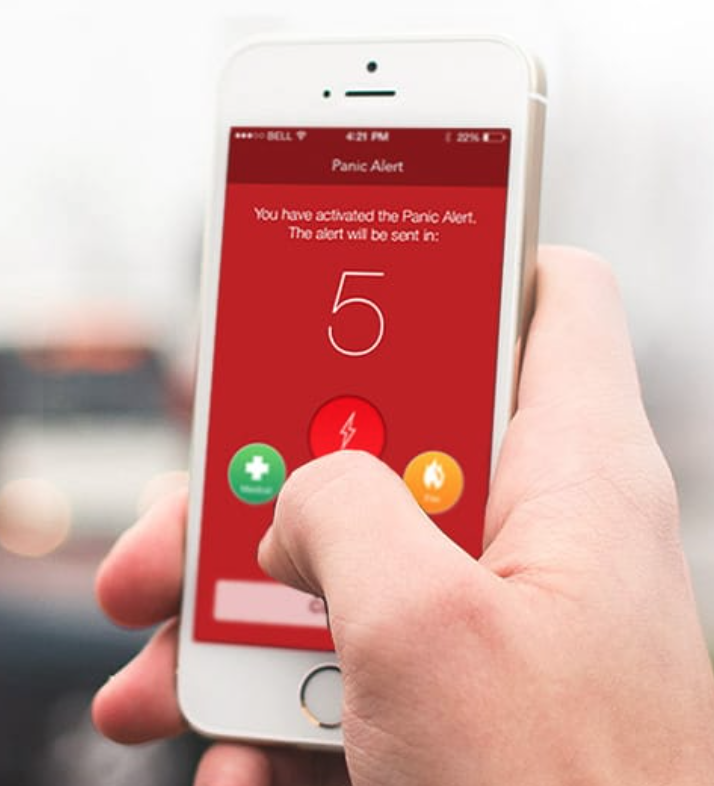 Alert1 does an automatic monthly test on its medical alert system. This test is silent, but the monitoring center will notify you if the system is not working. LifeFone does not offer any automatic testing option. Alert1 offers a voice extender, but LifeFone does not offer one on their website. The Alert1 emergency button has a 600 ft range from the base station, while the LifeFone emergency button only has a 480 ft range unless you purchase the extension. LifeStation uses the closest cell towers in your area, so it is not limited to a single cellular provider. LifeFone uses AT&T, which means you have to have coverage in your area. LifeStation will do a weekly test on your system to make sure that it is working properly. LifeFone does not do any test. However, they will call you each day for an additional fee. The emergency button for LifeStation has a 500 ft range. If you don’t purchase the extension, you only get a 480 ft range with LifeFone. Bay Alarm has been around as a company much longer than LifeFone. Their longevity means they are doing something right. Bay Alarm offers a weekly test for your medical alert system. This test is done from their command center, and it does not make any noise. You won’t even know the test happened unless something is wrong. LifeFone does not do a weekly or monthly test. The Bay Alarm emergency button has a 1000 ft range, but the LifeFone emergency button only has a 480 ft range unless you purchase an extension.